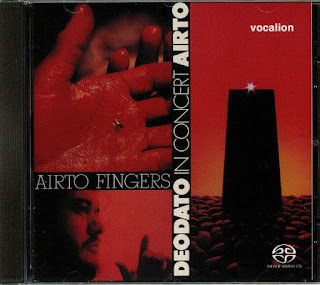 Jazz Station - Arnaldo DeSouteiro's Blog (Jazz, Bossa & Beyond): SACD of The Month - "Deodato/Airto: In Concert" + "Airto: Fingers"
SACD of The Month - "Deodato/Airto: In Concert" + "Airto: Fingers"
First reissue, on Super Audio CD format, of two albums recorded by percussionist Airto Moreira for the CTI label in April 1973: "Fingers," a flawless studio session cut at Van Gelder Studios in Englewood Cliffs (New Jersey), and "Deodato/Airto In Concert," taped live on April 20, 1973 at the Felt Forum of the Madison Square Garden Center in New York City, NY, but released only one year later in truncated form. This hybrid SACD includes both the stereo and quadraphonic mixes done by Rudy Van Gelder and producer Creed Taylor. 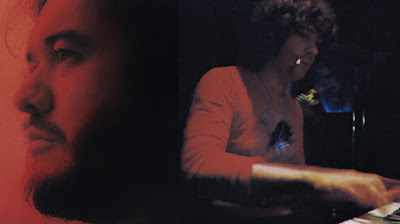 Unfortunately, it wasn't possible to include the complete Felt Forum concert for a simple reason: the only 5 tracks mixed for quad system (two performed by Airto, three by Deodato) were the ones selected for the original vinyl LP release. 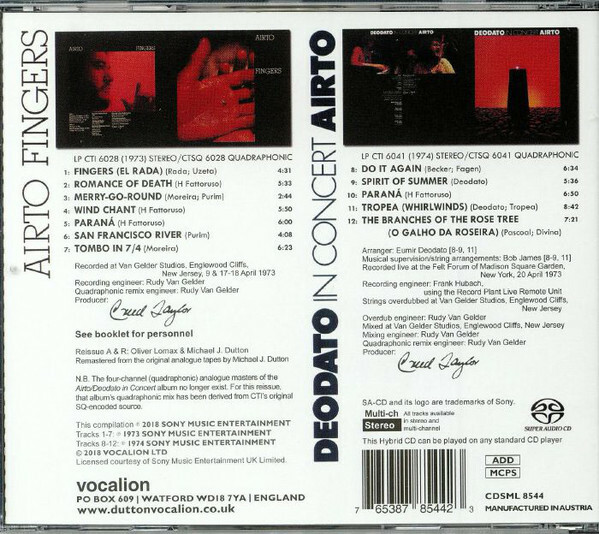 I hope someday we will see a 5.1 surround remix of the complete concerts performed by Deodato (previously issued on the stereo CD "Deodato Live At Felt Forum" in 1988) and Airto (a total of 6 tracks, 4 of them never released) on that historic event billed as "CTI 2001 Space Concert." For now, this Vocalion SACD, remastered by Michael J. Dutton, becomes a must-have item for CTI, Deodato and Airto collectors! Deodato's band: Eumir Deodato (Fender Rhodes electric piano, arranger), John Giulino (electric bass), Rick Marotta (drums), Rubens Bassini & Gilmore Digap (congas, percussion), John Tropea (electric guitar), Joe Shepley & Burt Collins (trumpet), Garnett Brown (trombone), Joe Temperley (baritone sax).